This page describes some of the research projects that students have done here at CSUS under my supervision. Most are M.S. projects, but some are senior projects or independent work. A few are students from other universities. Whenever possible, I try to steer student research into directions which have the potential of producing publishable work. Much of the work described on this page has been published in respected, peer-reviewed venues. In general, I prefer to supervise students who have taken one of my advanced Artificial Intelligence (CSc-215, CSc-180) or Graphics (CSc-155, CSc-165) courses. Although I sometimes make exceptions. Feel free to come by and talk to me about your ideas and interests. I am an author (with John Clevenger) of the 2017 textbook Computer Graphics Programming in OpenGL with Java. Many of the examples in the book were developed with the assistance of students at Sac State. There are many opportunities for expanding this development. Projects in this area require background in OpenGL GPU shader programming, such as is learned in CSc-155. 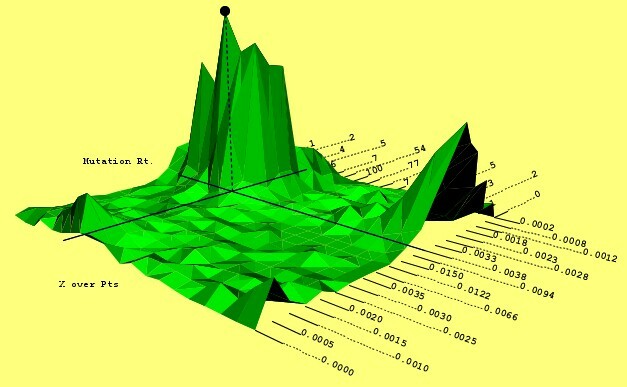 We also maintain a Java mathematics library for 3D graphics support called graphicslib3D. This package is an integral part of the textbook and therefore requires continual maintenance and improvement. 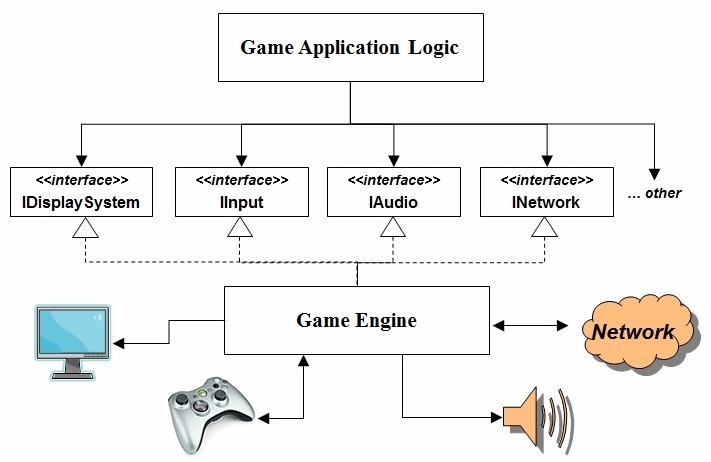 Computer game design and implementation is a complex and constantly changing field. Today, games are built using game engines - some popular ones are Unreal, Unity, and Lumberyard. At Sac State, students in CSc-165 learn about game engine internals, as well as game components and game engineering and implementation. We have our own simplified game engine called "SAGE", that is always in need of support. As such, there are always opportunities for SAGE-related projects for students who have graphics or game engine experience at the CSc-155/165 level. Genetic Algorithms are search methods based loosely on biological evolution, where populations of candidate strings evolve solutions to difficult problems. Evolutionary concepts of natural selection, crossover, and mutation are used to improve the solutions over time. QWOP is an online game in which a human player controls the limbs of a sprinter so as to complete a simulated 100-yard race. Steven Ray's masters project utilized a cellular genetic algorithm (CGA) to evolve the first software system to successfully complete a QWOP race. Steven and I presented the results at GECCO 2014, and the published paper is available here. It was also a "Humies" finalist (Human-competitive results competition). Although completing a QWOP race is a significant result, winning a QWOP race would be even better. It would require detecting more on-screen features in order to evolve a system that can adapt more effectively to the runner's movements. This would be an interesting follow-up project and would have an excellent chance of winning a Humie award. Genetic Programming (GP) is an extension of the Genetic Algorithm concept, in which the system evolves computer programs. The idea was first popularized by John Koza in the early 1990s. Sac State CSC undergrad Michael Vollmer (now a PhD student at the University of Indiana) developed an elegant GP framework in 2013 using the language Clojure, as a project in CSc-215. His system, called "fungp" is available here. We use fungp in CSc-215, and there are many opportunities for follow-on projects. In a Terrain-Based Genetic Algorithm (TBGA), the strings reside on a grid, and the genetic operations (e.g. crossover, mutation) function differently on various points of the grid. The differing environments form a sort of terrain, and the best solutions evolve wherever the parameters are the most agreeable for the problem at hand. Initial implementation and testing of the TBGA was done by Rebecca Pirie, Adam Wachter, and Scottie Sharp at Sonoma State University in 1998. Their work was supported by a RSCAP mini-grant and was presented at the International Conference on Genetic Algorithms. They showed that the TBGA outperforms a variety of other popular genetic algorithms on a suite of difficult test problems, and required less tuning. The four of us published a report at GECCO'1999 in Orlando, which is available here. The solid-rendering shown at the right was created in 2004 by the TBGA Visualization Tool, developed by a senior project team here at CSUS. The team members were Jim Thein, Michael Pope, Robert Carlin, Reuben Fauth, Matthew SantaCruz, and James Sanguinetti. The surface represents where on the terrain the best solutions are evolving. The higher the peak, the more solutions have been found at that location. Jim and I wrote a report that appeared in ICTAI'2004 in Boca Raton, which is available here. The TBGA was expanded into a Terrain-Based Memetic algorithm (TBMA) starting in 2009, through a collaboration with Carlos Azevedo, at the time a student at the University of Pernambuco (Recife, Brazil). In a "memetic" algorithm, a local search is incorporated into the genetic algorithm. 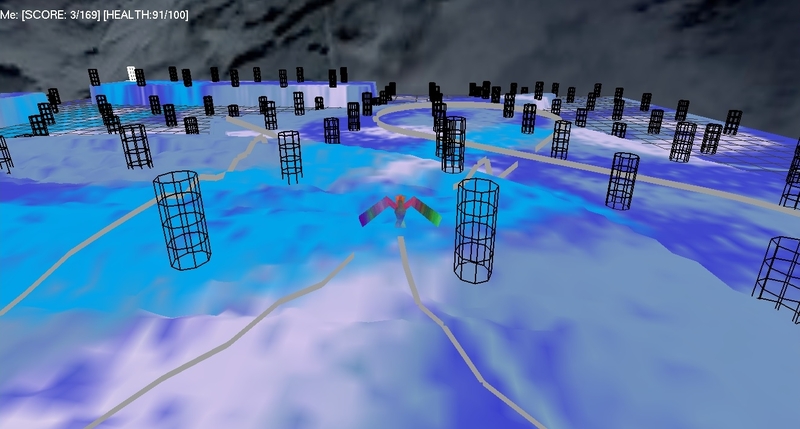 In the TBMA, the local search is tuned using terrain parameters. Carlos used the TBMA to achieve superior results on an image-compression application. We presented the findings at GECCO'2009 in Montreal, and the paper is available here. A follow-up study, which explored additional applications, was done in collaboration with Claus Aranha (a student at the University of Tokyo) and Carlos. The results were presetnted at the 2011 Brazilian Congress of Computational Intelligence, and the paper is available here. Vis-TBGA was expanded into a TBMA visualization tool (Vis-TBMA) in 2011 by CSUS M.S. student Brad Johnson. The genetic algorithm can be used to solve the classic' knight's tour problem. Terry Slocum worked on this problem at Sonoma State University, as part of my Artificial Intelligence course. More work needs to be done to compare the performance of several more sophisticated genetic algorithms on this same application. Terry and I published the results at CEC'2004 in Portland, which is available here. 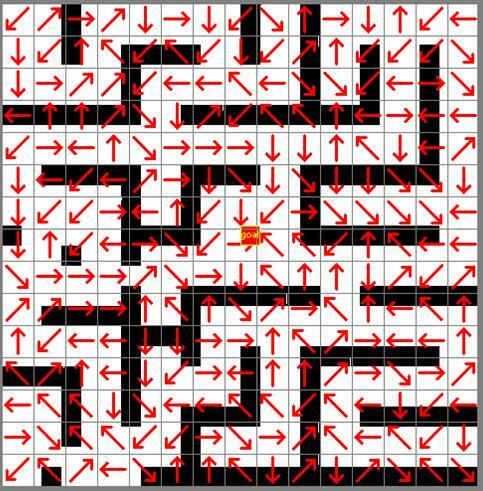 The genetic encoding used to solve the Knight's Tour can also be used to solve the problem of finding all paths through a maze. 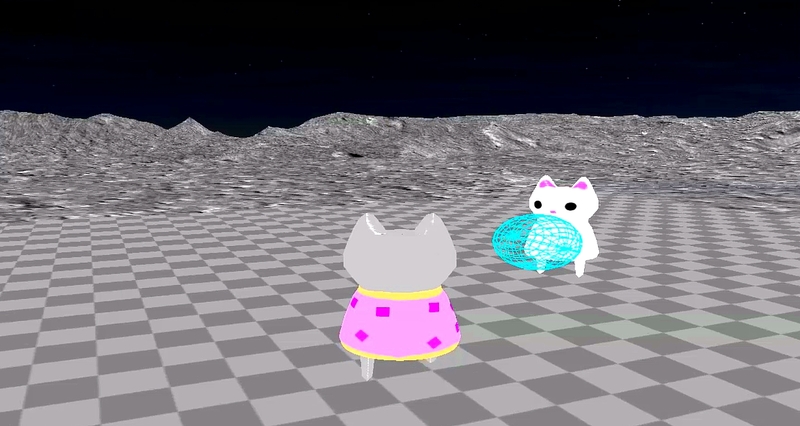 Zach Matley implemented a set of agents for his Master's project, evolving static direction maps for a game. The image at the right shows a static direction map evolved for his application using a simple genetic algorithm. Zach and I published a report at CEC'2004 in Portland is available here. Similarly, genetic algorithms can be used to find solutions to traveling salesman problems. Brian Johnson utilized a a genetic algorithm in conjunction with a GIS system (ArcGIS) to find delivery truck routes. 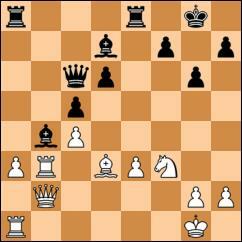 I am also interested in two-player strategy games such as chess, Go, checkers, Othello, etc. If you have an interesting idea, I would enjoy trying to help you try it. I also have some project ideas of my own. You would need to become familiar with the standard minimax and alpha-beta search algorithms. You can learn these in CSc-180 or CSc-215, or by reading web tutorials such as the one at AI-Depot. Normal minimax search assumes best play by the opponent. It also evaluates positions at the leaves of the tree only. Trappy minimax is different in both respects. It evaluates leaf nodes and interior nodes, and when a path evaluates very differently depending on the depth searched, that path may contain a trap. For example, if an opponent needs to search 5-ply to see that move A fails, but with only a 3-ply search might conclude that move A wins, then move A is a trap. Trappy minimax search includes this trap potential in its evaluation of each variation, sometimes favoring moves with higher trap potential. The resulting programs typically have lower ratings against computers, which are not susceptible to such tricks, but higher ratings against us fallible humans. The algorithm was implemented and tested by two graduate students here at CSUS: Ahmed Reda (using the game Othello), and Linda Huynh (using the game Checkers). Linda's version only looked for traps at the first ply, and its results were not much different than for standard minimax. However, Ahmed's version more cleverly looked for traps at the 2nd ply... his version, dubbed "Desdemona", achieved a rating of 1702 when competing on Yahoo Games against strong human opponents, while his same program using standard minimax only reached 1680. Ahmed and I published a report at the 2006 IEEE Symposium on Computational Intelligence and Games, which is available here. In 2014, Sac State undergraduate student Michael Vollmer (now a PhD student at University of Indiana) adapted trappy minimax to an existing chess program called "Chess Brain" (developed by Colin Frayn). The resulting system, dubbed Trappy Beowulf, had similar results as were observed above in Desdemona. The preliminary results are described in this white paper. A more comprehensive set of tests are being developed as the result of a recently completed senior project. For anyone interested in continuing work on Trappy Beowulf, this project has a high likelihood of resulting in a publication, as the ICGA Journal has expressed an interest in the results. Test yourself: Here is an example game tree below contains a trap. The black values are based on a 5-ply search, while the red values are based on a 4-ply search. Can you see the trap that a 3-ply opponent would fall into? Neural Networks are simplistic artificial "brains" made up of simulated neurons which are trained in various ways. The most common training method is called backpropagation. Sometimes, when there is no obvious solution to a problem, a system can be trained to solve it if examples can be provided. 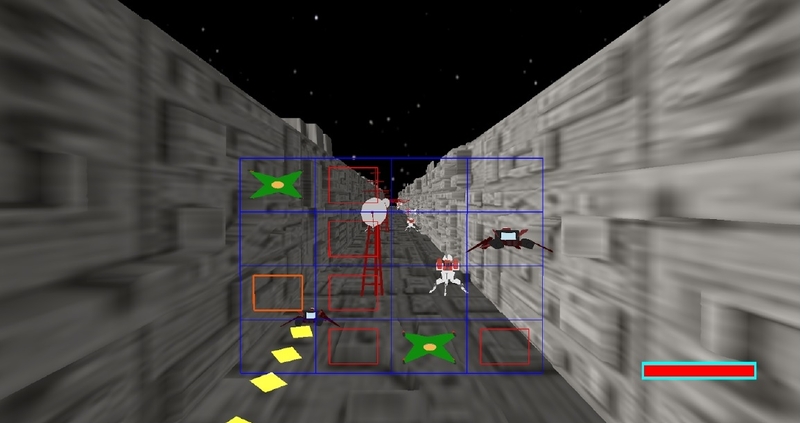 For example, Paul Skaggs trained a neural network to play a complex video game by learning from the movements of an expert human player, as part of his Master's project. Paul found that the network not only learned to play decently, it also emulated the style of the human trainer. Cognimem is a local company (in Folsom) that manufactures high-speed neural network chips. 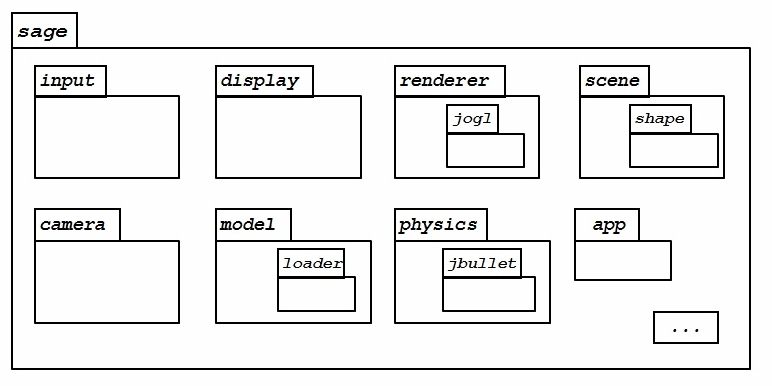 They are mounted on boards of various configurations. They have provided us with two V1KU boards, which include the neural network chips incorporated with a small camera. Included was an application for learning and recognizing objects. Hitesh Wadhwani extended this application to create a simple learning and tracking system using one V1KU board. As part of my 2011 sabbatical leave, I extended Hitesh's single-camera tracking system into a two-camera stereoscopic tracking system. A video of my crude but effective system can be seen here. 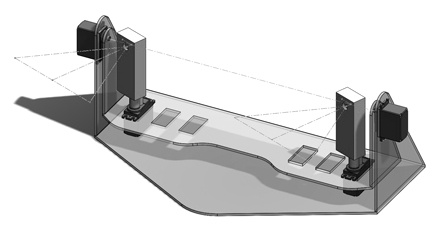 Adam Ruggles further improved the stereoscopic tracking system by building a better harness, and strengthening the learning and tracking algorithms by incorporating a Kalman filter. Several students and I have been experimenting with alternative training methods, including PSO (particle swarm optimization), genetic algorithms, as well as an extremely simple method that we have dubbed Neighbor Annealing. Our first results using the neighbor annealing algorithm have been written up in a paper that was presented at IJCNN (IEEE International Joint Conference on Neural Networks) in Hong Kong, June 2008. A .pdf of the paper is available here. Jeb and I detailed the results in a paper that was presented at IJCNN (IEEE International Joint Conference on Neural Networks), in Hong Kong, June 2008. A .pdf of the paper is available here. Jeb's work built upon earlier work by Michael Olsen-Darter (see below). Tim Bender and Michael Daniels studied various partitioning strategies for the SSNN, concluding that doing single divisions and delaying building complete partitions is the best approach. We published a report in the 2009 International Joint Conference on Neural Networks (IJCNN'09), and a .pdf is available here. The partial screenshot shown at the right was created in 2008 by a Visualization Tool for the Self-Splitting Neural Network, developed by a senior project team here at CSUS. The team members were Michael Daniels, James Boheman, Marcus Watstein, Derek Goering, and Brandon Urban. 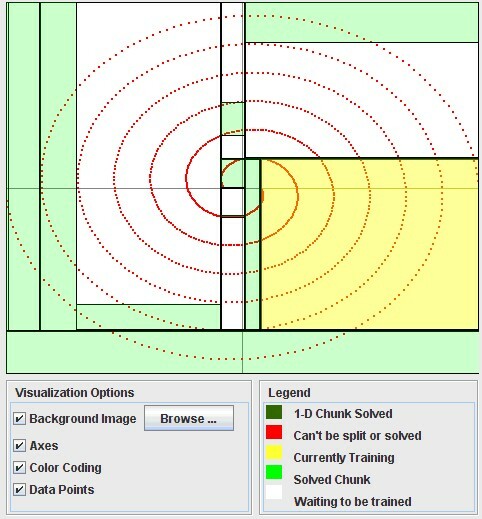 The green rectangles represent regions of a classification (2-spiral) problem that have been solved by separate neural networks during training. The visualization makes it easier to observe what the SSNN is doing and test alternative methods. The team and I published a report in the 2009 International Joint Conference on Neural Networks (IJCNN'09), and a .pdf is available here. Michael Olsen-Darter used a collection of neural networks to control the steering of a snowplow. Initially, he tried to solve the problem with a single neural network, but the problem was too large for the neural network to learn the training data. He came up with the idea of using several neural networks in a modular fashion, and divided the input domain uniformly among the networks. His final system utilized hundreds of neural nets and mimicked an existing mathematical steering model, with greater efficiency. 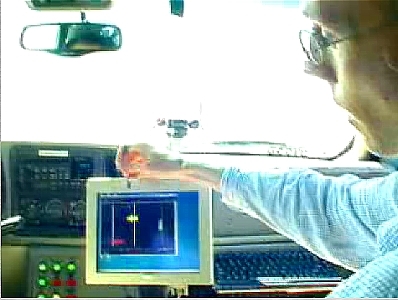 AHMCT (the Advanced Highway Maintenance and Construction Technology Research Center) developed the snowplow which includes a GPS screen as an aid to a driver during low-visibility conditions. Michael Olsen Darter worked at UC Davis for AHMCT, and developed the neural-network tool for his CSUS Masters project. It shows a prediction on a video screen of where the snowplow will be in the immediate future given its current heading. Michael and I published a report at IRI'05 and you can read it here. You can also see a video of the prototype system here. 2017 - Raymond Rivera - "RAGE: A Programmable Shader-Based OpenGL Renderer and Scene Graph"
2017 - Jon Tinney - "Virtual Reality on the Web"
2017 - Meetkumar Patel - "WEBOICE: Voice Enabled Web Browser"
2017 - Cody Jackson - "Virtual Reality Technical Demos"
2017 - Diveena Thirupathy - "Community Shop: A Web Application for a Social Shopping Experience"
2017 - Subashini Hariharan - "ZeroQ - Android Mobile Application"
2016 - John Keeling - "SpeKculator: Genetic Algorithm Chord Progression Generator"
2016 - Charu Khosla - "YouTube Data Analysis Using Hadoop"
2016 - Kalyani Gandhi - "Earthquake Prediction Using Spark"
2015 - Sripriya Shekar - "Content Analysis of Participant ITEST Journals"
2014 - Aditya Hiran Pilla - "Career Plan Tracker"
2014 - Eric Henderson - "Terrain Based Memetic Algorithm for a Self Splitting Neural Network"
2014 - Shirish Gajera - "An Improved LightsOut app for the Android"
2013 - Arun Pandian - "Training Neural Networks with Ant Colony Optimization"
2013 - Amer Harb - "Face Recognition in Hyper Facial Feature Space"
2013 - Sonal Sharma - "NNGo9x9: Evolving a Neural Network to play Go"
2013 - Greg Cantrell - "Viewer Perspective Kiosk"
2013 - Steven Ray - "Genetic QWOP - Evolving a Bipedal Gait in a 2D World"
2012 - Avinash Pandey - "Model for Communication with a Cognitive Memory"
2012 - Adam Ruggles - "Stereoscopic Tracking in Three Dimensions with Neural Network Hardware"
2012 - Nadir Hajiyani - "Web-Based Technology Solutions for Not-For-Profits"
2012 - Ameya Deo - "Neural Network for Intelligent System Monitoring"
2011 - Phaedra Krizo - "A High School Game Programming Curriculum and its Effects on Student Motivation"
2011 - Brad Johnson - "Terrain-Based Memetic Algorithms Visualization"
2011 - P. Hatwalne - "SQLiDetect: A Web-Based Intrusion Detection Application for SQL Injections"
2011 - Alok Nakate - "Neural Networks Non-Linear Scaling"
2010 - Brian Lavender - "Implementation of Genetic Algorithms into a Network Intrusion Detection System"
2010 - Hitesh Wadhwani - "A Tool for Tracking Objects through V1KU, a Neural Network System"
2010 - Ryan Norton - "Self-Splitting Neural Network Visualization Tool Enhancements"
2010 - Akshaya Togrikar - "Image Sharing Application (IShA)"
2010 - Dylan Bartholemew - "Two-Dimensional Chunk Extraction in Self-Splitting Neural Networks"
2010 - Jake Locken - "An Integrated Solution to Reducing Foam Waste in an Automated Beverage Dispenser"
2009 - Joseph Graf - "Checkers Game for the iPhone with Trappy Minimax"
2009 - Leo Lu - "Xiangqi with Trappy Minimax"
2009 - Teza Madalasa - "RSS Feeds System for News Websites"
2008 - Antoine Hersen - "Holonomic Functions and Ore Algebra in Axion"
2008 - Philip Truong - "Training Self-Splitting Neural Network with Particle Swarm Optimization"
2008 - Ratnesh Raval - "Retriever for the Desktop"
2007 - Hamid Ghasimeyeh - "Analysis and Implementation of a New Multiuser Strategy Game"
2006 - Tahar Lemseffer - "Course on Oracle Query Optimization"
2006 - Satish Chollangi - "Academic Advising Application Using ASP.NET2.0, C# and PSP2.1"
2006 - Paul Andrew Skaggs - "Games with Personality: Controlling Game Agents Using Artificial Neural Networks Trained for Unique Play Styles"
2006 - Jeb Crouson - "A Self-Splitting Modular Neural Network"
2006 - Venugopal Chilamkur - "Ingres-Oracle Bridge Tool"
2006 - Michael Pope - "Terrain-Based Genetic Algorithm - A Comparative and Visual Study"
2005 - Brian Johnson - "GIS Routing with a Genetic Algorithm"
2005 - Kamal Lemseffer - "Oracle Query Optimization"
2005 - Michael Negley - "A Java Applet that Uses Optimal Expectation to Play Yahtzee"
2005 - Linda Marie Huynh - "Checkers with Trappy Minimax"
2005 - Ahmed Reda - "A Trappy Minimax Algorithm"
2005 - Michael Olsen Darter - "Vehicle Steering Control Using Modular Artificial Neural Networks"
2004 - Hoa Vin Quach - "User Authentication Using Keystroke Analysis and Neural Network"
2003 - Zach Matley - "Evolving Static Direction Maps for Fast Pathfinding"